From the signature treatments of dedicated spas offering relaxing massages with exotic herbal oils, scrub, detox baths and invigorating wet-treatments to a full range of beauty and grooming services, Seychelles’ spas hold the answer to your complete renewal of mind, body and soul. Seychelles is a pristine sanctuary for diverse species of floral and fauna. The islands are home to an exciting diversity of birdlife that can be discovered on the wild or in specially designated reserves. Discover the treasures of this living natural history museum along its nature trails, through its breathtaking landscape, several national parks and other reserves and its increasing number of exciting eco-tourism ventures. Outside the cyclone belt and offering a year-round sailing season, moderate swells and gentle tides, there is no better way to enjoy Seychelles than by cruising their pristine waters by catamaran, keelboat, bareboat or kayak, to name but a few. The stuff of fisherman’s tales. 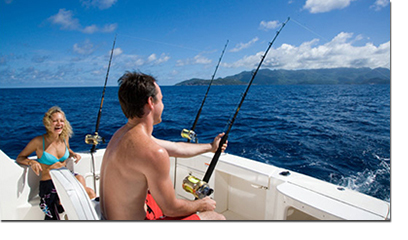 Over 1.4 million sq.km of fishing grounds offering catches of marlin, giant barracuda, shark and other prize game fish. Whether salt water fly-fishing, blue water fly-fishing or deep-sea fishing, you will be rewarded with some of the finest fishing in the ocean. Open the door to a vast world that lies between 4 and 10 degrees south of the equator. 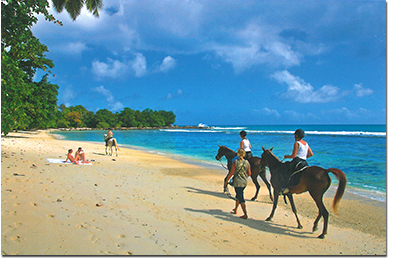 Home to a marine extravaganza as diverse and vibrant as it is unique. The inner islands reveal the abundance of marine life, including butterflyfish, angelfish, soldierfish and squirrelfish among others and reefs that feature octopus, spiny lobster and a plethora of nudibranchs. The Outer Islands offer rewarding experiences around the numerous coral atolls and sand cays accessible mainly by live-aboard charter yacht. 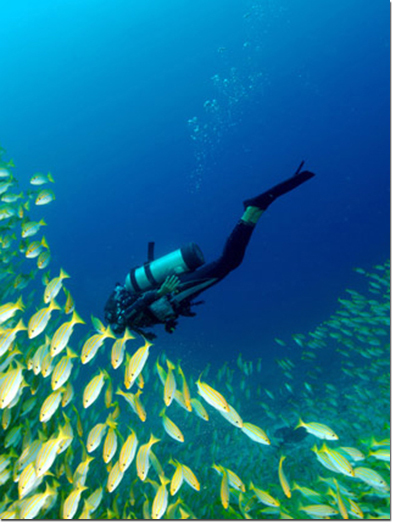 There are dive centers located on the island of Desroches, famous for its caves and canyons, and also on Alphonse with its spectacular drop-off. Although Seychelles enjoys an enviable reputation as the romantic destination of the tropics, it also proposes enticing holidays for families seeking glorious days packed with sea, sun and fun. A number of hotels throughout the islands have swimming pools and tennis courts and some also offer a range of water sports facilities, kiddies clubs and baby-sitting services. Motorized water sports are available in Mahe’s Beau Vallon Bay while the sands of countless beaches and the friendly waters just offshore will ensure memorable moments of family fun. On selected beaches the waves and wind are seasonal but challenging, Seychelles has a long tradition of great windsurfing opportunities for novice and expert alike, especially during the south east trades (May-September) when average wind speeds are 12-15 knots increasing to 25 during peak season in July and August. Surfing is also a popular pastime off Mahe, Praslin and La Digue but close attention must be paid to currents and underlying reefs. Kite surfing is also popular, especially during Seychelles’ windier moments. You are advised to bring your own equipment. Step from uncrowded beaches straight into the warm embrace of the purest turquoise water and live your dream of a perfect tropical island lifestyle in the land of perpetual summer. 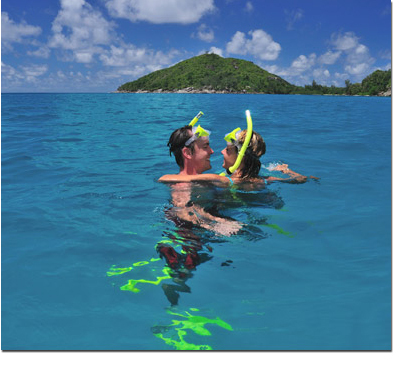 And, in the waters just offshore, you will discover the enchantment of the Seychelles marine parks where a living aquarium awaits you in the form of colorful schooling reef fish, octopus, lobster and turtle. For thrills on the ocean, Beau Vallon Bay is the place. Enjoy a selection of water sports that includes water-skiing, parachute rides, jet-skis, banana rides, sailing and so much more. 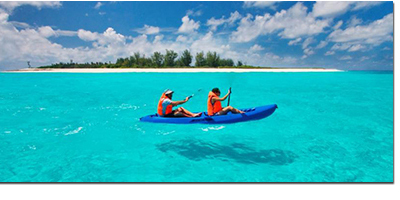 Non-motorized water sports are widely available at some resorts. 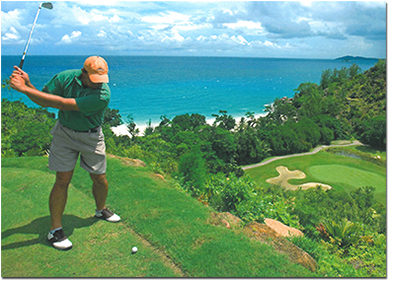 The Seychelles Golf Club on Mahe has a 9-hole course while Praslin’s Lemuria Resort boasts a spectacular new 18 holes championship course with views that will take your breath away. From La Digue’s Union Estate take a guided trek along its magical shoreline and savour the stunning scenery of one of the world’s most beautiful islands as you take in its innumerable charms in the way that nature intended – slowly! Enjoy the unique atmosphere of the local clubs and bars where you can dance to the latest music until the small hours. Most large hotels have public bars and often host their own programmes of evening entertainment where you can try local dances such as the Sega and Moutia. You can even test lady luck at casinos on Mahe and Praslin. Eating out in Seychelles ranges from the refined international cuisine of 5 star resorts and excellent local restaurants to delicious Creole dishes served to you in charming seaside bistros where you can soak up the vistas with your feet in the sand. Many hotels cater specifically for Asian, European and international tastes. Throughout the island, you’ll also find an array of cafes, pizzerias and snack bars.